I met a friend of mine from America here early last week and he asked me to give him two minutes on the state of Ireland. I told him I didn't need two minutes: The young want out, the old are afraid of cuts and the middle aged are looking at a retirementless, childless future. That was my assessment of mood of the country before we were forced to accept the IMF/EU bailout over the weekend. I think I can safely say the mood has not improved. In fact, if anything the mood has darkened, grown angrier and the focus of that anger is the government, which is now on its last legs. There are a million reasons for the Irish people to be disgusted with their leaders, but this past week takes the cake. All week the government denied that the IMF was at the door - even denying what was happening after the IMF man arrived in the country! Yesterday was even better. 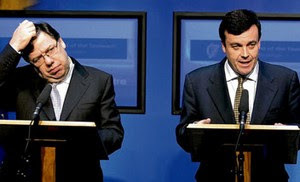 Taoiseach (Prime Minister) Brian Cowen and Minister for Finance Brian Lenihan gave a joint press conference at which they admitted that we needed "help" from the IMF and the EU. It was an amazing, mind-boggling performance as they took obfuscation and denial to a new level. Neither man ever used the word "bailout", but both talked about capital, contingencies, etc. At one point Lenihan referred to the "problems that have beset us." Beset. My wife was all over that. She turned to me - more in wonder than in anger - and said, "Did you hear that? Beset? He's talking like potato blight is once again wreaking havoc across the land. It's like he believes neither of them had a role in bringing us to this point." She is totally right. Both the Cowen and Lenihan, especially Lenihan, have frequently spoken of our problems as if a disease arrived on a ship and infected our banks. And, while the credit crunch did sweep the globe after the fall of Lehman, the dead black centers in our banks were made jointly by our greedy wreckless bankers, feckless regulators and (criminally) careless government. Never during the past two plus years, since the banking crisis blew up, have we had a full, frank admission that mistakes were made. More importantly, never did the government either (a) level with us as to the depth of the banks' problems or (b) learn the full truth themselves. Now the people are furious because they never had the truth nor leadership during the past few years capped off this week with the loss off all pretense of Irish independence. And it wasn't lost in a natural disaster.